Imagine 38 kilometres of breathtaking coastal imagery. The Great Ocean Drive near Esperance, Western Australia is what dreams are made of. The circular loop captures some of Western Australia’s most spectacular views. Separating each fascinating landmark are captivating views of the coastal scenery; where snow-white sand meets the sapphire blue body of the ocean. Although this road is much shorter that Great Ocean Road in Victoria, it has sheltered, pristine beaches with their crystal clear waters and snow-white sands, beautiful lookouts and lots of places to sit down and relax by doing nothing. 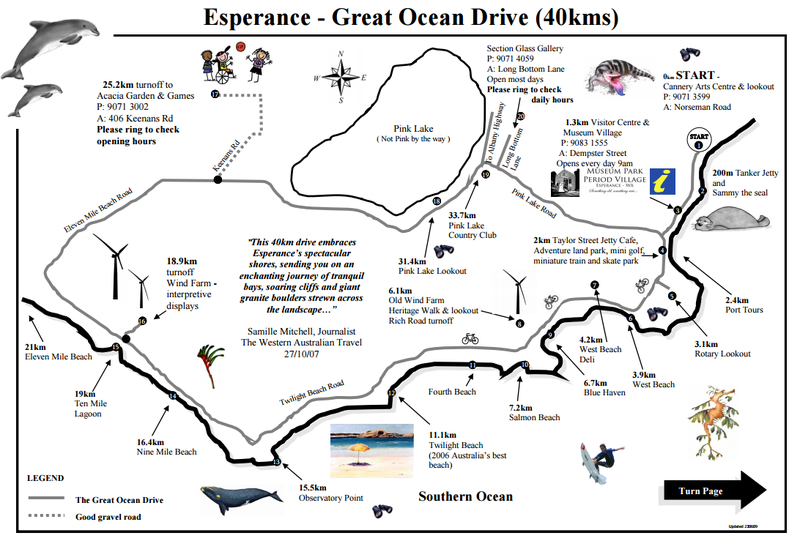 Sadly, we had only couple of hours to spend on the Great Ocean Drive. So plan ahead and book at least half of the day to explore this beautiful part of Western Australia. We started our way early morning, once we checked out from the cosy caravan park in Esperance, where we stayed for the previous night. We stopped at every lookout which was marked on our map and every stop was like this: “Wow, look at this! It is soooo beautiful!”. Twilight Beach was a highlight! Different rock formations, white sand and stunning views - absolutely love the Drive! As for wind farm, we didn’t stop there, as we’ve already seen a lot of wind farms in other places (e.g. near Portland in Victoria). We would highly recommend to drive this road to everyone, even if you have just an hour. The views are stunning and you will definitely find a good place to swim or just relax for a little bit.